The first detection of Pluto in X-rays has been made using NASA's Chandra X-ray Observatory in conjunction with observations from NASA's New Horizons spacecraft. There is a significant difference in scale between the optical and X-ray images. New Horizons made a close flyby of Pluto but Chandra is located near the Earth, so the level of detail visible in the two images is very different. The Chandra image is 180,000 miles across at the distance of Pluto, but the planet is only 1,500 miles across. Pluto is detected in the X-ray image as a point source, showing the sharpest level of detail available for Chandra or any other X-ray observatory. This means that details over scales that are smaller than the X-ray source cannot be seen here. Detecting X-rays from Pluto is a somewhat surprising result given that Pluto - a cold, rocky world without a magnetic field - has no natural mechanism for emitting X-rays. However, scientists knew from previous observations of comets that the interaction between the gases surrounding such planetary bodies and the solar wind - the constant streams of charged particles from the sun that speed throughout the solar system — can create X-rays. The researchers were particularly interested in learning more about the interaction between the gases in Pluto's atmosphere and the solar wind. The New Horizon spacecraft carries an instrument designed to measure that activity up-close - Solar Wind Around Pluto (SWAP) - and scientists examined that data and proposed that Pluto contains a very mild, close-in bowshock, where the solar wind first "meets" Pluto (similar to a shock wave that forms ahead of a supersonic aircraft) and a small wake or tail behind the planet. 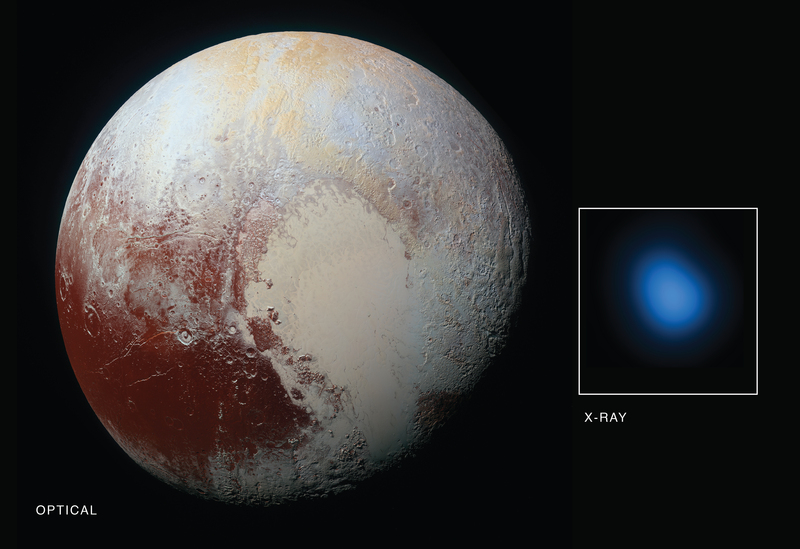 There are several suggested possibilities for the enhanced X-ray emission from Pluto. These include a much wider and longer tail of gases trailing Pluto than New Horizons detected using its SWAP instrument. Because Pluto is so small compared to the size of a Chandra point source, scientists may be unable to detect such a tail in X-rays. Other possibilities are that interplanetary magnetic fields are focusing more particles than expected from the solar wind into the region around Pluto, or the low density of the solar wind in the outer solar system at the distance of Pluto could allow for the formation of a doughnut, or torus, of neutral gas centered around Pluto's orbit. It will take deeper and higher resolution images of X-rays from Pluto's environment than we currently have from Chandra to distinguish between these possibilities.